We DO Content Marketing FOR YOU! This is a Template that you can re-purpose for your needs. Simply Get our current Chat Plan where we have done the heavy lifting an you simply create the content. We DO IT ALL FOR YOU (DIFY) in accordance with your budget. In consultation with you, we compile your calendar, create content, post the content regularly and consistently as required to achieve your marketing objectives plus supply a monthly performance report. Who your Ideal Customer is and what they are looking for. Where your audience hangs out, to go to where they are. What your Brand voice as well as the appropriate platform tone are. Have clear Marketing Goals & Objectives to guide and measure activity. Analyze your Customer’s Buying Journey & Buyer Readiness to ensure your content is relevant. How to measure and monitor engagement to improve effecttiveness. Content Generation best practices. Learn more. It’s all about getting customers to know you, to trust you and to buy from you. In the Online environment, great, relevant quality Content is key to promoting your business in the crowded online space. All your content should tell your story, consistently across all your platforms. To develop brand advocates who keeping buying, refer and share your message. In order for social media marketing to be an effective tactic, integration with other marketing activity is recommended to get best ROI. Social Media Integrated into your Marketing strategy is a powerful tool to achieve your Goals. Establishing a presence where your Customers are. Creating engaging content on selected platforms to build your Brand. You cannot build your business on rented property alone, you need owned real estate “Online Shopfront” AKA website/blog to showcase what you do. In order to put the Right Message, in front of the Right Customer, in the Right Place at the Right Time, you need to know your Ideal Customer better than anyone. When you know what makes them tick, what they want more than anything and how you can satisfy that need better than any other business, your marketing message is the result of a winning formula! 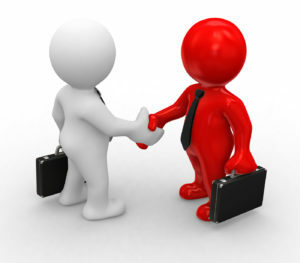 In order to convert prospects to customers you need to make an offer they cannot ignore. Your business must be as visible offline as online including print, flyers, signage in addition to location marketing and search. When you want your audience to take a specific action, the road you lead them down must be free of any friction and may require sign up forms, competitions, free offers and purchase incentives. 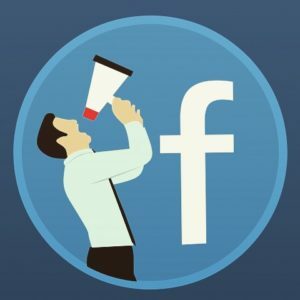 Facebook Like Ads are recommended to continuously attract a new audience and top up your sales funnel; also Boosted offer posts to your audience to increase conversion rates. The statistics below are quoted for the purpose of illustrating the volume of content competing for attention and the necessity for quality and consistency to be heard and seen above the noise. Facebook continues to reign in popularity over other social media with more monthly active users than WhatsApp (500 million), Twitter (284 million) and Instagram (600 million) combined (Source: CNBC). Q1 2018 Worldwide +2.20 billion monthly active Facebook making it the largest community in the world so confirming Facebook is too big to ignore. 66% Facebook’s audience are considered daily active users which means a huge number of Facebook users are active and consistent in their visits to the site, making them a promising audience for your marketing efforts. There are 1.15 billion mobile daily active users and mobile advertising revenue represented around 88% of FB’s ad revenue; reinforcing the fact that everything must be optimised for MOBILE. Age group 25 to 34 is the prime target demographic for many businesses’ marketing efforts and with them accounting for nearly 30% of the audience, you have the opportunity to engage these key consumers on Facebook. You can reach both genders effectively on FB. Facebook users are 76% female (out of 100% of all females) and 66% male (out of 100% of all males). Every 60 seconds 510,000 comments are posted, 293,000 statuses are updated, and 136,000 photos are uploaded on Facebook. That is a huge amount of information competing for their attention, so quality and strategy. Fortunately, Facebook provides Insights to track performance of content. 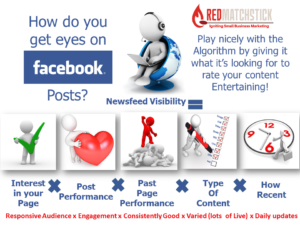 In order for content to be Engaging it must be SEEN and to be ‘seen’, Content Generators have to play according to Facebook Rules. How your Page performs over time – a stagnant page for more than a couple of days may as well be dead. Content that varies from video, to images, to Live, to text, to Links etc. How Recent Activity is on your Page including posting, responding, answering messages etc. It is not accidental that Facebook has a “Very Responsive” badge for Pages. Social Media Marketing experts are recommending posting around x4 per day. At least once should be a minimum for serious marketers. Need our help? Mail us right away! specify 3 Competitors, setup a Facebook Business Page, supply an image gallery, a logo plus any other branding specs and full pre-payment is required in advance of any services being delivered.